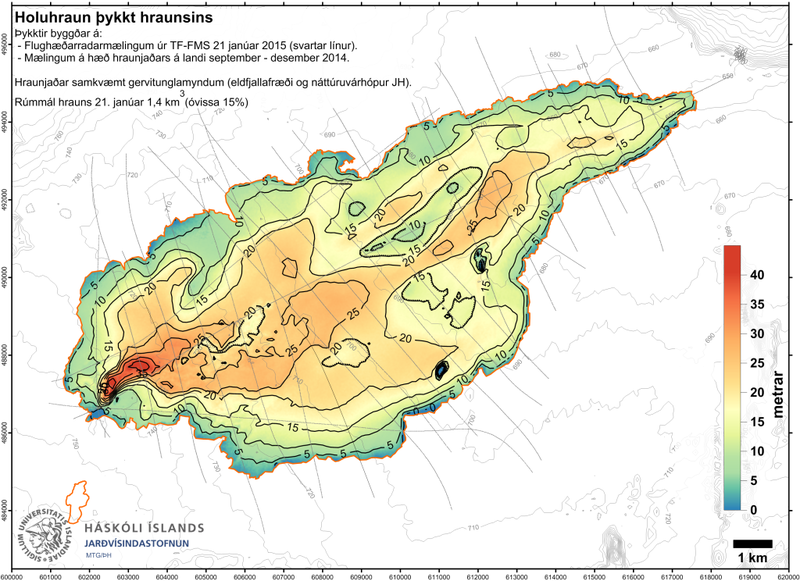 The Scientific Advisory Board met on Friday 30th of January 2015 and wrote this overview of the seismic activity in Bardarbunga and the volcanic eruption in Holuhraun. The document can be accessed here, with images and graphs, on pdf format. A powerful volcanic eruption is still on going in Holuhraun with a flow of lava around 100 m3 per second. It is probable that the course of events will develop in a similar manner as they have for the last few months, i.e. there will be a slow decrease in the volcanic activity. Information on the development of the activity refers on the one hand to the subsidence of the Bardarbunga caldera and on the other hand on the intensity of the volcanic eruption in Holuhraun. Bardarbunga: Data on the rate of the subsidence at the centre of the caldera, the volume of the subsidence, data on the tectonic movements around Bardarbunga (GPS, InSAR) and seismic activity. The volcanic eruption in Holuhraun: Data on the size and volume of the lava field, and valuation of gas and heat stream. A forecast based on extrapolating the current developments of the Bardarbunga subsidence shows that if the caldera keeps subsiding along a similar trajectory then the subsidence wil go on for another 5 to 16 months. With the same method the volcanic eruption in Holuhraun could evolve with similar pace and the eruption might last another 4 to 15 months. Information on the volume of the lava field in Holuhraun is not as accurate as the information on the subsidence of Bardarbunga. An eruption in Bardarbunga is still possible even though the development described above will continue. Even though the volcanic eruption in Holuhraun stops in the coming months it is not certain that the current rifting episode is at an end. It is still possible that an eruption may start on another part of the fissure swarm within the Bardarbunga volcanic system. The volcanic eruption in Holuhraun has now lasted for five months. Today there are 152 days since a continuous eruption started on the 31st of August 2014. The seismic activity started on the 16th of August and has therefore lasted for 167 days. The Coordination centre in Skogarhlid was fully activated on the 19th of August and the operation has therefore lasted for 164 days. For comparison the volcanic eruption in Vestmannaeyjar lasted for 130 days, from 23rd of February 1973 until 3rd of July the same year. Seismic activity in Bardarbunga continues to be strong. The strongest earthquake since the last meeting of the Advisory Board on last Tuesday was measured M4,6 yesterday, Thursday, at 21:45. Rather strong and flurry wave of seismic activity was recorded in Bardarbunga cauldron yesterday evening between 20:50 and 22:30 Three earthquakes stronger than M4,0 were detected over the period and only about 4-5 earthquakes between M3,0-4,0. In total around 100 earthquakes have been detected around the caldera since last Tuesday. Around 30 earthquakes were detected in the dyke during the same period, the strongest was M1,5. A few scattered earthquakes were detected in and around Tungnafellsjokull glacier and Askja since last Tuesday. Some activity has been detected around Herdubreid but no large earthquake. Today (Friday) gas pollution might be felt south and southwest of the eruption site. Tomorrow (Saturday) gas pollution will affect areas to the south and southeast.